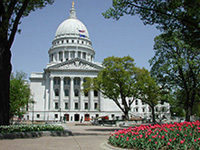 Wisconsin State Capitol. Photo: Wiss, Janney, Elstner Associates, Inc. In the introduction to the first historic structure report in this country, Charles E. Peterson of the National Park Service wrote in 1935, "any architect who undertakes the responsibility of working over a fine old building should feel obligated to prepare a detailed report of his findings for the information of those who will come to study it in future years." Since then, thousands of historic structure reports (HSRs) have been prepared to help guide work on historic properties. Photo: National Parks and Conservation Association. A historic structure report provides documentary, graphic, and physical information about a property's history and existing condition. Broadly recognized as an effective part of preservation planning, a historic structure report also addresses management or owner goals for the use or re-use of the property. It provides a thoughtfully considered argument for selecting the most appropriate approach to treatment, prior to the commencement of work, and outlines a scope of recommended work. The report serves as an important guide for all changes made to a historic property during a project-repair, rehabilitation, or restoration-and can also provide information for maintenance procedures. Finally, it records the findings of research and investigation, as well as the processes of physical work, for future researchers. A historical "first." 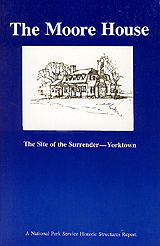 The first historic structure report prepared in the United States, The Moore House: The Site of the Surrender-Yorktown, was written by Charles E. Peterson of the National Park Service in the early 1930s. In the decades since the Moore House report was completed, preservation specialists commissioned by owners and managers of historic properties have prepared thousands of reports of this type. Similar studies have also been used for many years as planning tools in France, Canada, Australia, and other countries, as well as in the United States. Although historic structure reports may differ in format, depending upon the client, the producer of the report, the significance of the structure, treatment requirements, and budgetary and time restrictions, the essential historic preservation goal is the same. In response to the many inquires received on the subject, this Preservation Brief will explain the purpose of historic structure reports, describe their value to the preservation of significant historic properties, outline how reports are commissioned and prepared, and recommend an organizational format. The National Park Service acknowledges the variations that exist in historic structure reports and in how these reports address the specific needs of the properties for which they have been commissioned. Thus, this Brief is written primarily for owners and administrators of historic properties, as well as architects, architectural historians, and other practitioners in the field, who have limited experience with historic structure reports. It also responds to the requests of practitioners and owners to help define the scope of a historic structure report study. 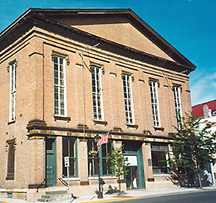 A historic structure report is generally commissioned by a property owner for an individual building and its site that has been designated as historically or architecturally significant, particularly buildings open to the public, such as state capitols, city halls, courthouses, libraries, hotels, theaters, churches, and house museums. It is certainly possible, but is less common, to prepare a historic structure report for a privately owned residence. The scope of such studies includes the interior as well as exterior of the historic structure. 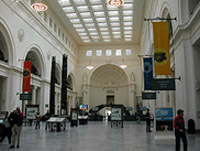 This is the interior of the Stanley Field Hall, Field Museum, Chicago. Photo: McGuire Igleski & Associates, Inc. Besides the building itself, a historic structure report may address immediate site or landscape features, as well as items that are attached to the building, such as murals, bas reliefs, decorative metalwork, wood paneling, and attached floor coverings. Non-attached items, including furniture or artwork, may be discussed in the historic structure report, but usually receive in-depth coverage in a separate report or inventory. One significant property may include multiple buildings, for example, a house, barn, and outbuildings; thus, a single historic structure report may be prepared for several related buildings and their site. 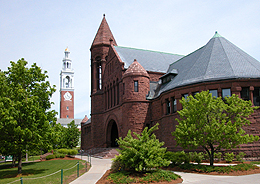 The University of Vermont has more than thirty contributing buildings in four historic districts listed in the National Register of Historic Places. The Campus Master Plan recognizes a commitment to respect and maintain the historic integrity of these facilities. Historic structure reports are available for many of the University's historic structures. Photo: University of Vermont Historic Preservation Program. Historic structure reports can be prepared for other historic resource types as well, including bridges, canals, ships, mines, and locomotives, which are categorized as structures by the National Register of Historic Places; sculpture and monuments, which are categorized as objects; and college campuses and industrial complexes, which are categorized as districts. For battlefields, gardens, designed landscapes, and cemeteries, which are categorized as sites, parallel evaluation and investigation is usually undertaken through a separate document called a cultural landscape report. For small or simple projects, the project team may include only one or two specialists while complex projects may involve a large number of investigators and specialists. Evaluation of this barn may primarily involve an historian, an architectural conservator, and a structural engineer. Photo: Wiss Janney Elstner Associates, Inc.
With such an array of subject matter, it is not surprising that preparation of a historic structure report is almost always a multidisciplinary task. For a small or simple project, the project team may include only one or two specialists. For a complex project, a team may involve historians, architectural historians, archeologists, architects, structural engineers, mechanical engineers, electrical engineers, landscape architects, conservators, curators, materials scientists, building code consultants, photographers, and other specialists. The disciplines involved in a specific historic structure report reflect the key areas or issues to be addressed for the particular property. The project leader or designated principal author for the report is responsible for coordinating and integrating the information generated by the various disciplines. Designation of a principal author may depend on the goals of the historic structure report and on which disciplines are emphasized in the study. In the development of any historic structure report, the scope of work and level of detail are necessarily adjusted to meet the requirements of a particular project, taking into account the property's significance, condition, intended use, and available funding. This does not mean that every significant historic property requires-or receives-a comprehensive investigation and detailed report. Some historic structure reports are of very limited scope. It may be necessary for a project to proceed without a historic structure report, either because of the cost of the report or a perceived need to expedite the work. Most large-scale or long-term work projects would benefit greatly from the preparation of such a report-and not only from the value of the report as an efficient planning tool (See box above). If work proceeds without a historic structure report to guide it, it is possible that physical evidence important to understanding the history and construction of the structure may be destroyed or that inappropriate changes may be made. The preparation of a report prior to initiation of work preserves such information for future researchers. Even more importantly, prior preparation of a report helps ensure that the history, significance, and condition of the property are thoroughly understood and taken into consideration in the selection of a treatment approach and development of work recommendations. One of the goals of a historic structure report is to reduce the loss of historic fabric or significance and to ensure the preservation of the historic character of the resource. The historic structure report is an optimal first phase of historic preservation efforts for a significant building or structure, preceding design and implementation of preservation, rehabilitation, restoration, or reconstruction work. Information contained in the report documents existing conditions and serves as a basis for proposing physical changes. As additional information is learned relevant to the history of the building, and as work on the historic structure is implemented, the report can be amended and supplemented. Is the building's history well understood? Has the period of significance been established? Does the building represent a variety of periods of construction, additions, and modifications, not all of which may be significant? What archival documentation is available? Does the building have physical problems that require repair? What construction materials and systems are known to exhibit distress or deterioration? Does the building have code or functional problems that interfere with its use? Is the building in use? Is a new or more intensive use planned? Is funding available to commission the report needed to address these requirements? If not, can the scope of the report be reduced to answer critical questions in a limited report? Has the time frame for the overall project been established? The length of time required to prepare a historic structure report and the budget established for its development will vary, depending on the complexity of the project, the extent and availability of archival documentation, and to what extent work has already been performed on the building. If the scope of a historic structure report for a simple building is limited to a brief overview of historic significance, a walk-through condition assessment, and general treatment, the study and report may be completed within a few months' time by an experienced investigator. On the other hand, a historic structure report for a larger building with numerous past alterations and substantive problems will require extensive research and on-site study by a multidisciplinary team. This type of report can often take up to two years to complete. At the Hudson Opera House, a multi-arts center in Hudson, New York, the historic structure report was prepared incrementally. The first phase of the report focused on assessment and recommendations for repair of the roofing, the most critical issue in preservation of the building. Photo: Gary Schiro. If budgetary constraints preclude completing the historic structure report as one project, it can be prepared incrementally. The work recommendations should not be developed or implemented prior to completion of research and investigation, except for emergency stabilization to prevent immediate failure or damage, or temporary measures to address critical health and safety issues. A partial historic structure report can be completed in preparation for anticipated work that must be initiated to preserve or protect the building. This type of report includes analysis of only those building elements and systems that may be affected by the proposed work, and involves only the specialists needed to address the types of investigation and work planned. For example, research and documentation of existing interior finishes may be required before undertaking localized structural stabilization that will require removal of interior materials. In undertaking such work prior to the completion of a historic structure report, caution should be taken not to alter or unnecessarily remove changes to the building that had occurred over time. The completed report may conclude that such changes to the building may have acquired significance in their own right and therefore merit preservation. Sometimes a historic structure report is initiated when repair or restoration work on the historic building has already been completed. Although it is always recommended that the study be done prior to new work, in this case, the report needs to document--as fully as possible-the condition and appearance of materials, elements, and spaces as they existed prior to the work performed. The extent to which this can be achieved depends on the quality of archival documentation available and physical recording undertaken prior to the completed work. The report should describe the nature and extent of the past repair or restoration work, and, if possible, should also document research performed, reasons for design decisions made, and the construction process for the work already completed on the structures. Commissioning a historic structure report requires answering a series of questions to establish the scope of work. The goals of the report need to be defined and the report should be designed to support planning for the future of the historic structure. 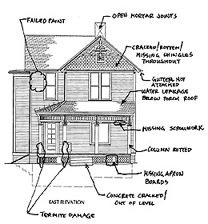 This effort may involve gathering information to answer questions about what is significant about the building and site; what uses are appropriate for the building, or whether existing uses need to be modified; what known conditions require repair and whether those repairs are urgent; and what short-term and long-term goals need to be addressed. Finally the available budget for the historic structure report project should be established before a request for proposals is issued. The procedures for preparing a historic structure report and the outline of report content and organization can serve as the basis to develop a scope of work for the study and also to solicit proposals for a report that reflects the requirements of the specific structure, and, of course, the available budget. Although the request for proposals should always establish such a scope of work, firms may be invited to suggest adjustments to the scope of work based on their past experience. The request for proposals should include a qualifications submittal from each proposer. This submittal should include resumes for the principal investigators and a description of experience in preparing historic structure reports or similar studies, as well as experience with buildings of similar type, age, and construction to the subject of the study. References and sample of work may be requested from the proposer as part of this submittal. An interview with one or more candidates is highly recommended, both so that the proposers can present their project approach and qualifications, and so that the client can ask questions in response to the submitted proposal. 1. The level of significance of the property will certainly influence the cost. That is, a property that is nationally significant would likely require a greater effort than a property that is only locally significant. 2. The treatment and use for which the historic structure report information provides a basis is an important cost consideration. If the decision is reached to maintain a building in its current form, the level of effort required in preparing a historic structure report would be less than where the intended treatment is a comprehensive restoration. A change in building use likewise may increase the level of effort; for example, the additional work involved in addressing different building code provisions. 3. The availability of information about the historic resource has a direct bearing on costs. Some historic structures are well researched, and drawings may have been prepared to exacting standards, while others may require considerable original research and investigation to establish the evolution of the structure. On occasion, a property owner's in-house staff or volunteers may undertake research in advance of a contracted study as a way to reduce the cost of the report. 4. The location of and access to a historic building is a cost factor for some studies. A property in a remote mountain location can involve high travel costs relative to properties in or near an urban area. 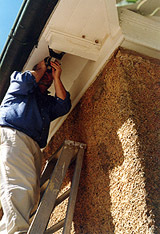 A structure requiring special techniques for exterior physical inspection would involve higher access costs than a small residential structure. Numerous factors influence the cost of preparing a historic structure report including the level of significance, size, and complexity of the property; required treatment and use; existing condition; and the location and access to the structure. 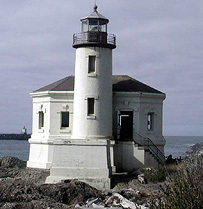 Historic structure reports were prepared for several small lighthouses along the Oregon coast, including the Coquille River Lighthouse, shown here. Photo: Wiss, Janney Elstner Associates, Inc.
5. The size and architectural character of a property affects the time required to prepare a historic structure report. A simple four-room vernacular structure would usually involve less effort than a complicated high-style courthouse with many significant spaces. 6. The physical condition of the structure and also the extent of physical fabric that is accessible for study will be cost determinants as well. Obviously, a property in good condition is usually less problematic than one in a deteriorated state. For a structure that was continuously occupied and where alterations cover earlier fabric, the opportunity to extract information from physical fabric dating to early periods may be limited without extensive removals that are usually beyond the scope of the historic structure report study. Even where buildings are vacant, there are instances where certain physical investigations may need to be limited because of the destructive impact that will occur to historic fabric. 7. The type of final report that is required can significantly affect the cost of the project, but is an area where costs can readily be controlled. Historic structure reports do not necessarily need to be professionally bound and printed. In-house desktop publishing has become commonplace, and a formal work product can often be obtained without excessive costs. Overly sophisticated printing and binding efforts represent a misplaced funding allocation for most historic properties. There are distinct advantages to having a report prepared in an appropriate electronic form, thus reducing the number of hard copies and facilitating future updates and additions to the report. For most properties where historic structure reports are prepared, ten or so hard copies should suffice. Providing one copy of the report in a three-ring binder is a helpful and inexpensive way to furnish the owner with a "working" copy of the document. Historical research is directed toward gathering information on a structure's history, original construction and later modifications, occupancies, and uses over time. Research may range from national repositories such as the Library of Congress to local collections or private family records. Old newspapers, architectural journals and even manufacturing trade catalogs can be surprising sources of historical accounts and illustrations. 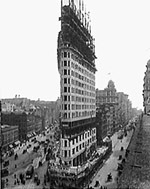 This circa 1902 photograph of New York's Flatiron Building is of the construction in progress; such photographs are useful in understanding building chronology as well as concealed conditions of as-built construction such as building framing. Photo: Library of Congress, LC-D401-14278. A preliminary walk through of the building and its site with the owner or site manager, appropriate building staff representatives, and key members of the historic structure report team is important to review the project scope of work. During the walk through, a brief review of existing conditions can be performed to highlight user concerns and gather information about distress and deterioration observed. Building staff may also be able to provide information on recent repairs, current maintenance procedures, and specific areas of active deterioration. A brief review of existing documentation available on site is also useful. Site personnel may be able to recommend additional archival resources. Archival research should be directed toward gathering information on the building's history, original construction and later modifications, occupancies, and uses over time. Research for the report is not intended to produce a large compendium of historical and genealogical material, but rather selected information necessary to understand the evolution of the structure, its significance, and justification for the treatment selected. For significant sites where other types of studies such as archeological investigations or a cultural landscape report have been completed or are underway, coordination is required to ensure that research information is shared and that the research effort is not duplicated. If a National Register nomination or other inventory has already been completed for the building and its site, the bibliography of that document may suggest possible sources for further research. In addition, a completed National Register nomination can serve as a starting point for development of the historic structure report sections on history and significance, and can be included in the appendix of the report. Public and university libraries, and state and local historical societies are likely sources of relevant materials. Municipal records collections often contain deed and building permit information that is useful in developing a chronology of ownership and construction. Architectural, engineering, and construction documents, shop drawings, repair documents, and maintenance records are valuable sources of information. The original drawings and specifications, if extant, may be kept at the archives of the historic building but may also have been retained by the firm that designed the building or successor firms. Building records and other archival documentation may have remained with the structure or site, with previous owners, or with related properties. Historic photographs are invaluable in developing a chronology of building changes and in determining the character and detailing of missing elements. Photographs in private collections, not intended as formal documentation, can often be useful. For example, family photographs taken outdoors can document a building that appears in the background. Renderings and paintings can also be useful, but these images must be carefully analyzed and compared with other information to ensure accurate interpretation. Correspondence and oral histories can be important additions to the overall information, but may be unreliable and should be confirmed, when possible, by comparison with photographic documentation and physical evidence. Fire insurance maps, such as Sanborn maps, can provide information on type of construction materials. When maps from different years are available, these can be useful in developing a chronology of additions and other changes to the structure. Archeological studies may be valuable in uncovering important evidence of changes to a historic structure. 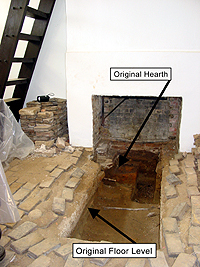 Following historical research and after several archeological soil probes, a decision was made to excavate an area in front of a mid-nineteenth century fireplace, revealing the original dirt floor and hearth undetected by earlier restoration efforts. Photo: NPS files. A survey is performed to document physical spaces and elements, and to assess the current condition of building materials and systems. In conjunction with historical research, the condition survey helps determine the historic integrity of a structure. The survey and inspection should address the building's exterior and interior materials, features and finishes; structural systems; interior spaces; mechanical, electrical, and plumbing systems; and fire detection and security systems. Further study may be required such as non-intrusive or intrusive investigation, field testing, sample removal, and laboratory testing and analysis of materials. Archeological investigations can provide information on the locations of building foundations and other sub-grade building elements, and can assist in developing information on the function of adjacent site areas, building elements, and previously unfinished floor spaces. The survey may also address the immediate site landscape, if this is not covered in a separate cultural landscape report. Information gathered during the survey can be documented with field notes on baseline drawings consisting of field sketches or measured drawings. In addition, documentation can include photographs (35-mm, large format, digital, perspective-corrected, and scale-rectified photographs; photogrammetry; and laser techniques), sketches and measured drawings, computer-aided design and drafting (CADD), video records, and written notes and field measurements. Depending upon project requirements, documentation may need to be prepared to archival standards regarding paper, photographs and negatives, electronic records, and backup data. The collection of the Historic American Building Survey/Historic American Engineering Record (HABS/HAER) archive at the Library of Congress should be searched in case the property has been previously documented through drawings and photographs. While many historic properties have been documented since the start of this invaluable collection in the 1930s, it is still more likely that this type of documentation does not exist for a property for which a historic structure report is being undertaken. Preparation of such documentation to portray the current condition of a property can be an invaluable addition to the historic structure report. Besides serving as a documentary record of a structure, the recording documents can serve another purpose such as an easement document, information for catastrophic loss protection, interpretive drawings, or baseline drawings for proposed work. If undertaken as part of the current building study, the measured drawings and record photography should follow The Secretary of the Interior's Standards and Guidelines for Architectural and Engineering Documentation. The use of special access methods may be necessary for close-up investigation of building elements. 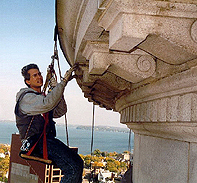 At the Wisconsin State Capitol, project architects and engineers used rappelling techniques. Photo: Wiss, Janney, Elstner Associates, Inc.
Field examination and testing of building material may include non-destructive (non-intrusive) or, where necessary, destructive (intrusive) examination and/or testing of materials, components, and systems. Examples of non-destructive methods of field examination and testing include field microscopy, the use of a metal detector to locate concealed metal elements, and X-ray techniques to assess concealed conditions. Some examples of destructive methods of field examination and testing include structural testing, strain relief testing, and inspection openings (probes). Instruments such as a borescope, through which concealed conditions can be viewed through a small hole, permit enhanced examination while limiting damage to the existing building fabric. Depending upon existing conditions and the results of the site inspection, field monitoring may be required. Field monitoring can include humidity and temperature monitoring, documentation of structural movement and vibrations, light level monitoring, and other environmental monitoring. Paint studies may not only help establish the chronology of paints and paint colors used on a building but also may aid in the dating of existing architectural features. Examination of the paint layers on these modillions utilizing a hand-held microscope enabled an investigating team to confirm in the field which modillions were original and which were later replacements. Photo: NPS files. In addition, materials samples may be removed for laboratory studies. A wide range of laboratory testing may be appropriate to establish the composition of various construction materials, determine causes of deterioration, and identify and assess appropriate conservation and repair measures. Materials analysis may also be helpful in dating changes to the structure and in developing a chronology of construction. For example, mortar analysis may be performed to determine the composition of original and repointing mortars and to provide information for use in designing a mortar mix for repointing. As another example, paint and other coatings may be analyzed to determine finish types and composition, and original and subsequent color schemes, using special analysis techniques and comparison with color standard systems. Samples should generally be returned to the owner and retained in case future testing is required. In some cases, it may be appropriate to reinstall the samples after materials studies have been completed. Sample removal and analysis may also be required to identify hazardous materials, which are present in many historic buildings. For example, lead and other heavy metals are components of many older paints and coatings, and asbestos is a constituent of some roofing materials, claddings, sealants, and insulation. Mold and mildew may be present and require special treatment; in this case a consulting industrial hygienist may need to be included in the project team. Analysis may be performed to confirm the materials present, determine the nature of the hazard, and help identify methods of remediation or management. As buildings constructed during recent decades become "historic," newer materials require study and analysis as part of historic structure reports. For example, curtain wall components and joint sealants may require analysis to determine their composition, identify causes of deterioration, and select appropriate replacement sealants. Composite materials and plastics, present in post-World War II buildings, may also require special effort to determine repair techniques or appropriate materials for replacement. All of the information gathered during the physical investigation, and through field testing and laboratory analysis, should be documented in field notes, sketches, photographs, and test reports. This information is incorporated in the historic structure report and provides a basis for the development of treatment recommendations. The process of evaluation occurs throughout the study of the historic structure as information is gathered, compared, and reviewed. Historical data and physical evidence are reviewed to help evaluate the historical, architectural, engineering, and cultural significance of the property, its construction and use, and occupants or other persons associated with its history and development. This evaluation includes determination of the period(s) of primary significance. An overview of the building's history and an assessment of its significance are included in the report. Preservation focuses on the maintenance and repair of existing historic materials and retention of a property's form as it has evolved over time. Rehabilitation acknowledges the need to alter or add to a historic property to meet continuing or changing uses while retaining the property's historic character. Restoration is undertaken to depict a property at a particular period of time in its history, while removing evidence of other periods. Depending on the historical significance of the property, and whether a detailed history has already been written, a brief or more detailed history may be appropriate. A chronology of construction and changes to the building, developed through historic and physical research, is an effective approach to identifying original building elements, as well as modifications that have occurred over time. If a comprehensive National Register nomination or other inventory has been prepared, the significance may already be defined. In other cases, the significance of a building and even its treatment may have been established through authorizing legislation or through the charter of an organization or foundation that owns the historic property. Where appropriate, however, the building's significance should be re-evaluated in light of research performed for the historic structure report. The results of the research, investigation, and field and laboratory testing are reviewed as a basis for developing specific work recommendations. The history and significance of the building and its site are evaluated to understand what spaces, elements, and finishes are of architectural or historical importance, and to confirm the overall project goals and treatment direction. The physical condition of the building and its systems is evaluated with regard to existing deterioration and distress, and needed repairs, as well as changes required to meet treatment goals. Attention is given to identification of life safety issues and code considerations. Conditions are also identified that could lead to future safety risks, loss of historic fabric, or loss of performance. The treatment approach selected for a building usually is determined by the intended use of a property, funding prospects, and the findings of an investigation. The Wolf Creek Inn, operated by the Oregon Parks and Recreation Department, is among the most intact and oldest active traveler's inns in Oregon. The historic structure report outlined a rehabilitation treatment which included such work recommendations as repairs to specific historic fabric, landscape restoration and site improvements, and upgrading of the building's mechanical and electrical systems. Photo: Historic American Building Survey, 1934. Once the building's history, significance, and physical condition have been researched and investigated, an appropriate treatment is usually selected. Depending upon the intended use of a property, funding prospects, and the findings of the investigation, it may be necessary in some cases to identify and discuss an alternate treatment as well. For example, a building currently occupied by caretakers that is a candidate for restoration and use as a museum may require such ambitious funding support that, for the foreseeable future, a more practical treatment could be to preserve the building and retain the caretakers. In this case, the treatment recommendation would be to restore the property and project work relevant to the restoration would be described. However, the alternate treatment (in this instance an interim one) of preserving the building in its current form would also be described, including discussion of work appropriate to preservation such as repairing the existing roof and installing a monitored fire detection system. In selecting an appropriate treatment, The Secretary of the Interior's Standards for the Treatment of Historic Properties can be particularly helpful. In use for more than twenty-five years, the Standards are a widely accepted means of planning for and undertaking project work in a manner that preserves historic materials and elements. The Secretary's Standards have been adopted by many state and local review entities for review of work proposals on historic structures. The Standards and their accompanying Guidelines describe four different options for treatment and list recommended techniques for exterior and interior work consistent with each option. One treatment (preservation, rehabilitation, restoration, or reconstruction) is usually selected and followed throughout the course of a project involving a particular building. Application of a single treatment approach helps to avoid inappropriate combinations of work, such as restoring a building's appearance to an earlier time in history while simultaneously constructing a new addition. The work recommendations are a central feature of the report. They are developed only after the research and investigation has been completed and the overall project goal established as to whether a particular building should be preserved, rehabilitated, restored, or reconstructed. The specific work recommendations need to be consistent with the selected treatment. If analysis performed during the study suggests that the approach or use initially proposed would adversely affect the materials, character, and significance of the historic building, then an alternate approach with a different scope of work or different use may need to be developed. The process of developing work recommendations also needs to take into account applicable laws, regulations, codes, and functional requirements with specific attention to life safety, fire protection, energy conservation, abatement of hazardous materials, and accessibility for persons with disabilities. 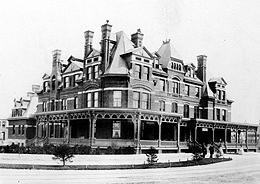 The historic structure report for the Hotel Florence, shown here in 1886, provided a basis for stabilization and repair work which has been completed. Initial phases of work addressed preservation of the building envelope, structural repairs, and limited mechanical and electrical improvements. The report also provided recommendations for future rehabilitation work that will be implemented in phases as funding becomes available. Photo: Historic American Buildings Survey. In addition to project goals, the proposed work is also guided by the building's condition. The scope of recommended work may range from minor repairs to structural stabilization to extensive restoration. In addition, the scope of work may be very narrow (e.g., priming and painting of woodwork and repair of deteriorated roof flashings), or very extensive (e.g., stabilization of timber framing or major repair and repointing of exterior masonry walls). The result of implementing (or not implementing) the recommended work needs to be considered as the recommendations are developed. Of course, the available project budget is also a factor in determining the extent of recommended work and whether it must be accomplished in several phases or projects. Whether or not available budget is the primary factor in determining the extent of work that can be performed, it is often useful to prioritize recommended work items. The recommended tasks can be examined in terms of relative importance and the time required for implementation. Prioritizing repairs can be critical where immediate or short-term work is needed to stabilize a building or structure, eliminate safety hazards, make the building weather tight, and protect it against further deterioration. Appropriate procedures for undertaking the recommended work items are described in the historic structure report and are intended to serve as a basis for planning the repair, rehabilitation, or restoration design. The level of detail to which the work items are defined should be limited in the historic structure report, as these recommendations serve as the foundation for, rather than in place of, design and construction documents for the work. For example, baseline drawings annotated with existing condition notes can later serve as a starting place for development of construction drawings. Outline procedures provided in the report for recommended work items can be used later to develop specifications for the work. Finally, a general opinion of probable costs associated with the recommended work is often prepared. A cost estimate is useful to building owners and managers in budget planning and also assists in prioritizing the work. For large or complex projects, the services of a professional cost estimator may be helpful in this effort. 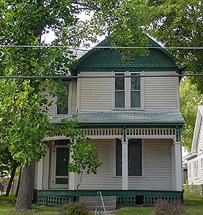 The historic structure report for the Noland House in Independence, Missouri, a vernacular house that is significant as part of the context of Harry S. Truman's life and family in Independence, Missouri, includes photographs and measured drawings to record existing features and conditions of the building. The measured drawings will also provide a basis for construction documents for future preservation work. This photograph illustrates the front elevation of the house. Photo: Bahr, Vermeer & Haecker, Architects Ltd. Upon completion of the research, physical investigation, evaluation, and work recommendations, the historic structure report is compiled. The principal investigator may submit an outline of the report for owner review at the beginning of the report preparation. A draft report may also be submitted for review when the report is partially complete, especially if there are many new research findings, significant physical distress conditions to be addressed, or complicated choices to be made in determining the treatment. This is one of the measured drawings for the Noland House. Drawing: Bahr, Vermeer & Haecker, Architects Ltd. The report should be prepared in a style and format that is readily accessible and user-friendly; however, it is not essential that a standardized method or format be followed for all historic structure reports. The report can be primarily narrative or graphic, but is most typically a combination of these formats. Ease and economy of report preparation should be considered but should not take precedence over clarity and thoroughness of documentation. In addition to meetings with site personnel early in the study process, it is helpful for the project team to meet at key points during the research, investigation, and development of the historic structure report. For example, it is useful for the project team members performing archival research to meet with site personnel to review documents and findings, and to help ensure that important archival sources have not been overlooked. Project team members may also walk through the building with site personnel during the investigation phase to review and discuss existing conditions and possible recommendation approaches. When the report is in draft form, a meeting of the project team with those personnel who will be reviewing and using the report is useful to discuss overall goals, treatments, and recommendations as these are being developed. Finally, when the study is complete, a presentation of the completed study by the project team helps to familiarize the owner and building personnel with the report, highlight key issues, answer questions, and provide a transition to the use of the report as a working document by the building's caretakers. The scope of the study-historical research, condition survey, investigation and testing, evaluation, selection of appropriate treatment, and development of specific work recommendations-generates a wealth of information about the history and condition of the building and the specific work needed to, preserve, rehabilitate, restore, or reconstruct it. This information is typically a combination of historical and technical data obtained by different members of the project team and presented as an integrated report in text, photographs, drawings, and tables. The project leader or principal author must guide the development of the report so that key issues are addressed, information is documented and assimilated in the report findings and discussion, recommendations are clearly presented, and no information is lost or misinterpreted in the compilation process. In order to integrate the many pieces of information into a coherent and comprehensive whole, the historic structure report is generally organized into two principal sections preceded by a brief introduction that summarizes overall findings and recommendations and provides project administrative data. The main sections of the report consist of (1) a narrative that documents the evolution of the building, its physical description, existing condition, and an evaluation of significance; and (2) a discussion of historic preservation objectives, together with recommendations for an overall treatment approach and for specific work. The report is usually supplemented with footnotes or endnotes, bibliography, and appendices of historical documentation and technical data. It is highly recommended that a post project record of all work performed later be added as a supplement to the historic structure report. This record may consist of annotated drawings, photographs, and other documentation of the work performed. Site personnel may help coordinate this supplement or record if the principal author of the report is not involved in the later construction phase. Some organizations and government agencies consider the post project record to be a third part of a historic structure report and not just a supplement. When physical evidence is discovered during the course of the construction work or when new documentary evidence is discovered as research continues after completion of the report, this also should be recorded and incorporated into the historic structure report or in an appendix to the report. An important goal of the historic structure report process is to maintain the report as an active and working document, both to facilitate the use of information compiled in the report and to permit the report to readily accommodate new information as it becomes available. The historic structure report is most often prepared in the form of a printed, illustrated manuscript. In recent years, attention has been given to creating or transforming the historic structure report into an electronic document as well. In electronic format, the report can easily be shared with interested parties and is readily updated. However, because historic structure reports are still mostly produced in printed format (although sometimes concurrently with an electronic document), it is important that, after production, one or more copies be provided to the property owner and also made available to the project team. As the basis for design and construction documents, the historic structure report needs to be readily available and extensively used during implementation of the work. At least one site copy should be maintained in a physical format that can be readily updated, such as a three-ring notebook to which additional documentation can easily be added. Field documentation materials, including photographs and negatives, measured field drawings, condition reports and surveys, materials test reports, and other information gathered during the study can be stored in an archive by the building owner for future reference. An archival copy should also be provided to the owner, and a minimum of one archival copy kept at the project site and at an appropriate local or regional archive, such as a state historical library. Copies of the historic structure report may also be provided to a local historical organization or university and the state historic preservation agency or historical society. In addition, a copy may be given to the National Trust for Historic Preservation Library at the University of Maryland at College Park, which has established a reference collection of historic structure reports. 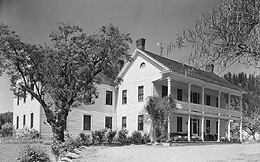 Various agencies and organizations have employed historic structure reports as planning tools for many years, for example, the National Park Service, General Services Administration, New York State Office of Parks, Recreation and Historic Preservation, and the Society for the Preservation of New England Antiquities. These and other agencies and organizations may have specific requirements and procedures for reports prepared for properties under their stewardship that differ from those described in this Preservation Brief. All historic structure reports, however, share a common goal-the careful documentation and appropriate treatment of significant historic structures. The historic structure report is an optimal first phase of historic preservation efforts for a significant building, preceding design and implementation of its preservation, rehabilitation, restoration, or reconstruction. If work proceeds without a historic structure report as a guide, physical evidence important to understanding the history and construction of the building may be destroyed. The preparation of a report prior to initiation of work provides documentation for future researchers. Even more importantly, prior preparation of a report helps ensure that the history, significance, and condition of the property are thoroughly understood and taken into consideration in the selection of an appropriate treatment and in the development of work recommendations. A well prepared historic structure report is an invaluable preservation guide. Introduction. This section includes a concise account of research and investigation findings and recommendations for treatment and use, and a record of project administrative data. Study Summary—a brief statement of the purpose, findings, and recommendations of the study, including major research findings, key issues addressed by the study, and a summary of recommendations for treatment and use. Project Data—a summary of project administrative data (e.g., location, ownership, and landmark status of property) and the methodology and project participants. Part 1 Developmental History. This section consists of a narrative report based on historical research and physical examination documenting the evolution of the building, its current condition and causes of deterioration, and its significance. Historical Background and Context—a brief history of the building and its context, its designers and builders, and persons associated with its history and development. Chronology of Development and Use—a description of original construction, modifications, and uses, based on historical documentation and physical evidence. Physical Description—a description of elements, materials, and spaces of the building, including significant and non—significant features of the building. Evaluation of Significance—a discussion of significant features, original and non—original materials and elements, and identification of the period(s) of significance (if appropriate). Condition Assessment—a description of the condition of building materials, elements, and systems and causes of deterioration, and discussion of materials testing and analysis (if performed as part of this study). Part 2 Treatment and Work Recommendations. This section presents the historic preservation objective and selected treatment (preservation, rehabilitation, restoration, or reconstruction), requirements for work, and recommended work that corresponds with the defined treatment goal. Historic Preservation Objectives—a description and rationale for the recommended treatment and how it meets the project goals for use of the building, e.g., rehabilitation for a new use, restoration for interpretive purposes, etc. Requirements for Work—an outline of the laws, regulations, and functional requirements that are applicable to the recommended work areas (e.g., life safety, fire protection, energy, conservation, hazardous materials abatement, and handicapped accessibility). Work Recommendations and Alternatives—a presentation of tasks recommended to realize the proposed treatment approach; evaluation of proposed solutions; and description of specific recommendations for work, including alternate solutions, if appropriate. Supplemental Record of Work Performed. This section documents work performed, which may include planning studies, technical studies such as laboratory studies or structural analysis, or other investigation work that was not part of the scope of the original historic structure report, and records physical work on the building (construction documents, annotated drawings, photographs). The section is usually added later to update the report, as most historic structure reports are issued prior to implementation of the recommended treatment approach and specific work. It is sometimes referred to as Part 3 of the report. Completion Report—a record of the work accomplished, physical evidence discovered during construction, and how findings affect interpretation of the building. Technical Data—a collection of field reports, material data sheets, field notes, correspondence, and construction documents. Deborah Slaton is an Architectural Conservator with Wiss, Janney, Elstner Associates, Inc., in Northbrook, Illinois. The author gratefully acknowledges the following individuals for their assistance in the preparation and review of this brief: Alan W. O'Bright, National Park Service; John Volz, Volz & Associates; Philip D. Hamp, Vinci-Hamp Architects, Inc.; William G. Foulks; and Travis C. MacDonald, Jr., Thomas Jefferson's Poplar Forest. Additional thanks go to Jeffrey P. Koerber, Clark University, and Harry J. Hunderman, Joshua D. Freedland, and Kenneth M. Itle, Wiss, Janney, Elstner Associates, Inc. The following staff of the Technical Preservation Services, National Park Service, offered valuable comments during its development: Sharon Park, FAIA, Anne E. Grimmer, Michael Auer and Chad Randl. Charles E. Fisher and Kay D. Weeks of the National Park Service's Heritage Preservation Services were the technical editors for this publication project. Burns, John, editor, with the staff of HABS/HAER, National Park Service, U.S. Department of the Interior. Recording Historic Structures. Washington, D.C.: The American Institute of Architects Press, 1989. Jandl, H. Ward. Preservation Brief 18. "Rehabilitating Interiors in Historic Buildings: Identifying and Preserving Character-Defining Elements." Washington, D.C.: National Park Service, 1988. McDonald, Jr., Travis C. Preservation Brief 35. "Understanding Old Buildings: The Process of Architectural Investigation." Washington, D.C.: National Park Service, 1994. Nelson, Lee H., FAIA. Preservation Brief 17. "Architectural Character: Identifying the Visual Aspects of Historic Buildings as an Aid to Preserving Their Character." Washington, D.C.: National Park Service, 1988. The Secretary of the Interior's Standards for Rehabilitation & Illustrated Guidelines for Rehabilitating Historic Buildings. Washington, D.C.: U.S. Department of the Interior, National Park Service, Preservation Assistance Division, 1992. Secretary of the Interior's Standards and Guidelines for Architectural and Engineering Documentation. Washington, D.C.: U.S. Department of the Interior, National Park Service, Historic American Buildings Survey/Historic American Engineering Record, 1983. Slaton, Deborah, and Alan W. O'Bright, guest editors. Association for Preservation Technology International (APT) Bulletin XXVII, no. 1 (1997). Special issue on historic structures reports. Weeks, Kay D., and Anne E. Grimmer. The Secretary of the Interior's Standards for the Treatment of Historic Properties with Guidelines for Preserving, Rehabilitating, Restoring & Reconstructing Historic Buildings. Washington, D.C.: U.S. Department of the Interior, National Park Service, Cultural Resource Stewardship and Partnerships, Heritage Preservation Services, 1995.